Looking to take the next step in your driving career? Want to help hundreds of people pass their HGV driving test? Become a HGV Instructor with our HGV instructor training course now! Get in touch with Wayside Transport by calling 01202 873 911 today to find out more. Why choose HGV instructor training for your next step? There is nothing more satisfying than seeing your trainee through their course and onto a successful career path. If you have over three years’ experience driving Heavy Goods Vehicles, transfer your valuable skills to a rewarding career in HGV instructing now. With so many businesses after talented HGV drivers, we’re after HGV driving experts to take the next step and help others realise their potential with a career in driving Heavy Goods Vehicles. Our comprehensive HGV instructor training course is designed to transition you from an expert HGV driver to a competent and able driving instructor. Becoming an HGV driving instructor is simpler than you think. 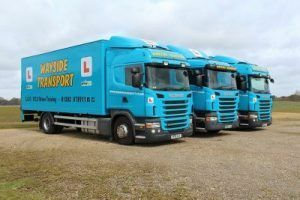 There are three easy steps to the Wayside Transport HGV instructor training course which draw upon your knowledge, driving ability and instructor skills so you will feel confident and well-prepared when it comes to your test day. Before you can begin our HGV instructor training course, you need to access your official number by enrolling on the DSA Voluntary Register. Book your test at a local centre before you attend a HGV instructor training course so you’re fresh off the line and full of all the necessary knowledge needed to pass your exam. You can book your test at either the Poole test centre or Southampton test centre – whichever is convenient to you. Our experienced staff are expert at helping you to reach the next step, so trust our HGV instructor training course to get you to where you want to be. We don’t just expect you to arrive at your HGV instructor training exams and immediately know everything. Our HGV instructor training course takes 10 days to complete. In that time, our friendly and experienced staff will take care in preparing you for each step so you can arrive at your exam feeling confident. There are two things we focus on in our 10-day instructor training course, both of which are imperative to passing your LGV training test. We all develop bad habits as we become more experienced in driving HGV vehicles. You’ll spend 5 days of our instructor training course ironing out any niggles in your driving so you know the standards required to teach the next line of recruits. There’s one thing knowing how to drive, but knowing how to transfer your skills and knowledge to another individual is another matter entirely. We want you to blast your Instructional Ability Test, so we’ll spend 5 days teaching you how to teach! So there you have it. Within 14 days you could be a fully qualified instructor, out on the front line, allowing the next bunch of talented drivers access to a rewarding career. At Wayside Transport, we want to offer as many people as possible the opportunity to enter a career in driving. That’s why we have a range of courses for all levels. If you know someone who wants to have a successful driving career, get them to contact us now. Take the next step and contact Wayside Transport about our HGV instructor training course now.